The title of this blog post is sure to cause stomachs to rumble. I can imagine people thinking, finally this guy is writing about chicken sandwiches and the various delicious options from food carts, but then once it gets figured out people think, WTF, this guy is writing about shopping carts?!? 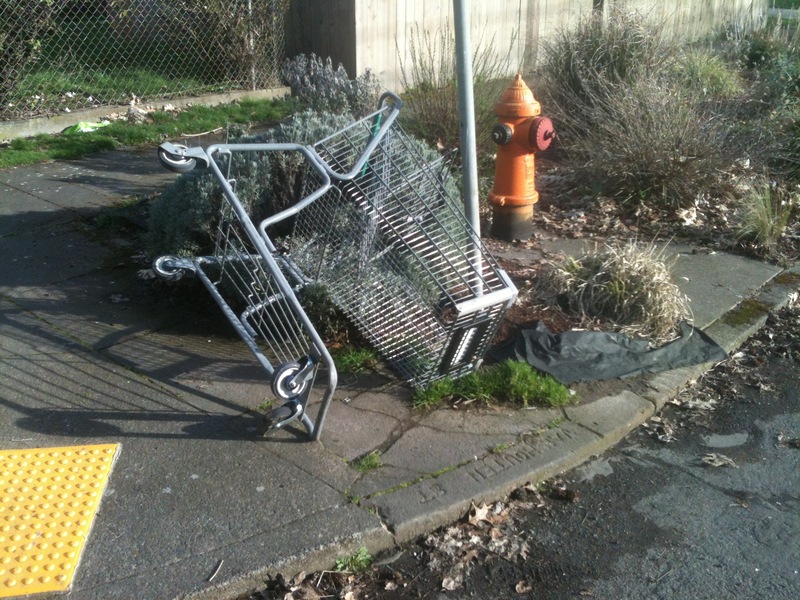 When I began noticing random shopping carts in neighborhoods while I was biking to work it seemed like this phenomenon was worth writing about. 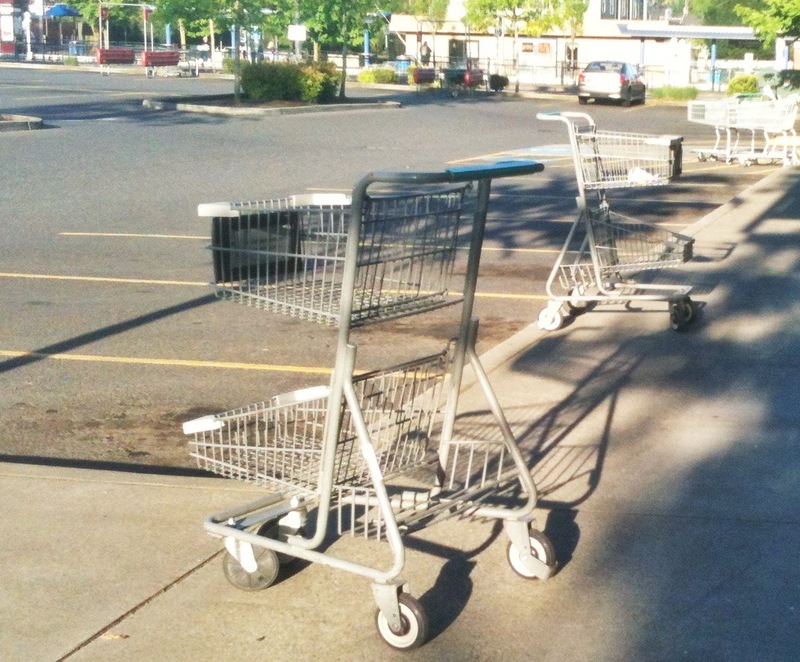 These carts had strayed from their usual grocery store and parking lot environments. It was strange to see them outside of that context. Appearing next to a tree or leaning against a street sign, they stood out. I waited for a revelation or inspiration to make a grand statement, but realized there is nothing to say about them and there is no one to speak for them. The are lost souls in a wilderness of consumerism. 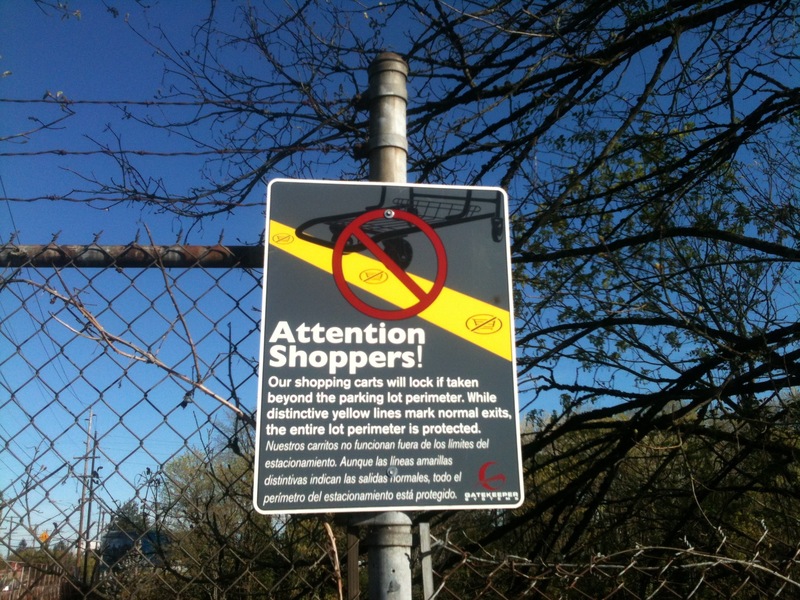 You may see these shopping carts and not give them a second thought. Many are used by the homeless to haul belongings. Some stores have tried to implement security so carts can’t leave. According to my research, though, there is a widely known work-around allowing many to escape. Escape they do, but for what purpose and where? 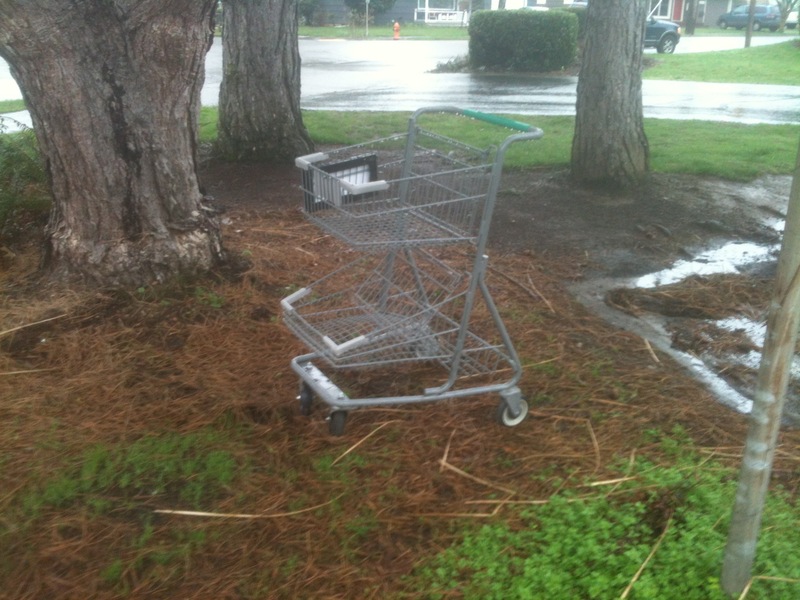 I became concerned with the matter of shopping cart neglect while pondering several examples of these simple, dutiful machines. They make shopping easier for us, but in the real world they are tossed out, knocked over, abandoned and abused, far from the brightly lit aisles and their good time, gentle rolls. I noticed them scattered all over North Portland – on sidewalks, gathered around signage, and on the bike path that parallels Columbia Blvd. Some were stuffed with trash while others lay on their sides like dying horses. 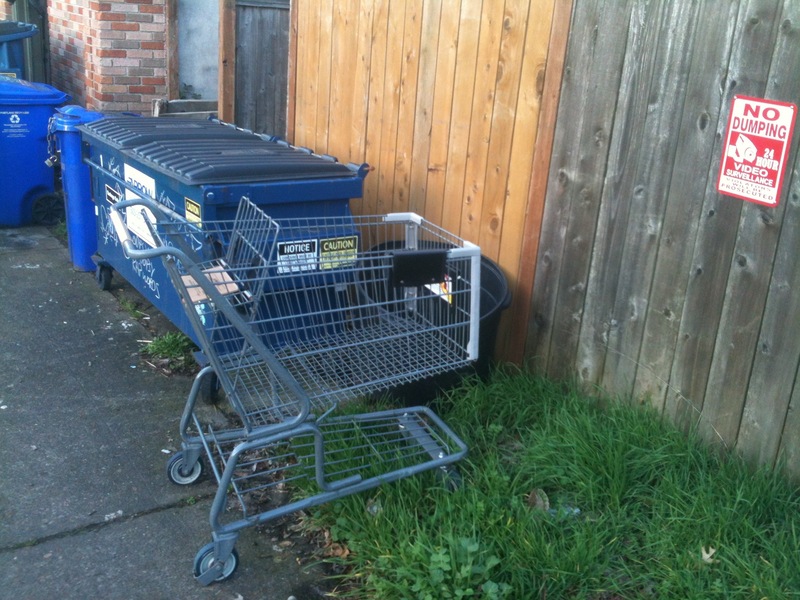 I talked to a person who saw me taking a picture of a cart parked behind her house. It stood in a no man’s land between her fenced-in property and the alley. She told me what an eyesore she thought it was. She was hoping someone (maybe even me) would haul it away. I was there only for the sake of documenting the cart. The last thing I need is a shopping cart zoo, but it’s nice to know I could have one if I wanted it. That cart has remained unmoved for months in what now seems lost in an Island of Misfit Toys scenario, abandoned with no one coming to its aide. I could have sworn I saw a guy with a sign on his truck that advertised a cart retrieval service, but tracking him down and hearing his adventures is a whole other blog post. At this point he seems to be slacking on the job. My shopping cart sightings eventually led me to something I could get excited about. 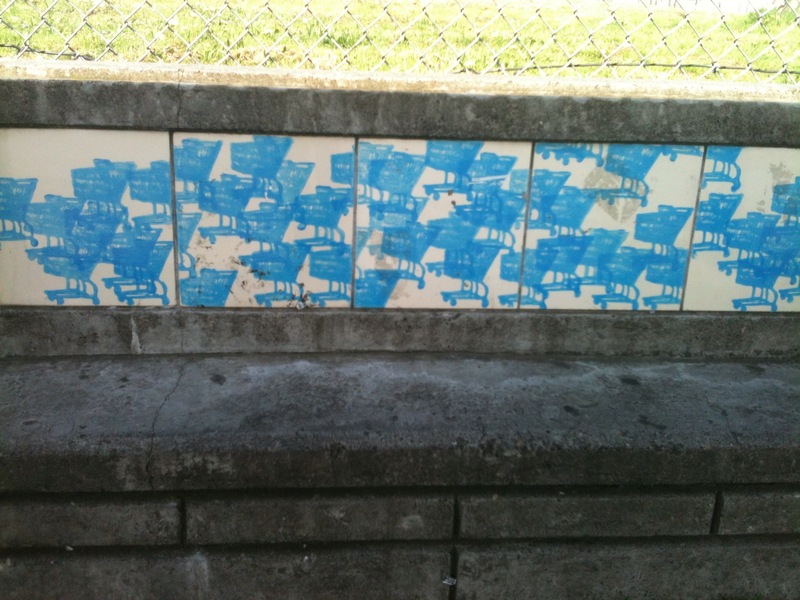 At the Lombard Transit Center bus stop, I spotted a piece of shopping cart public art. Of all the types of art that move me, this one had me shaking. There, at N. Interstate and Lombard skirting a low wall, is an art piece featuring fifty overlapping shopping carts stenciled in blue. Nothing I’ve seen or photographed has approached this level of art that I saw when I made this discovery. After seeing cart after cart and trying to make sense of it, this cart art seemed to compile, in a figurative sense, all the sad and wayward carts I’d encountered in my travels. The photos I post may give you a sense of the art but a pilgrimage to witness it in person, while no doubt passing multiple abandoned shopping carts in the process, would be well worth it. Not for the faint of heart. Five panels of shopping cart art! Carts found in their native land, a grocery store parking lot! 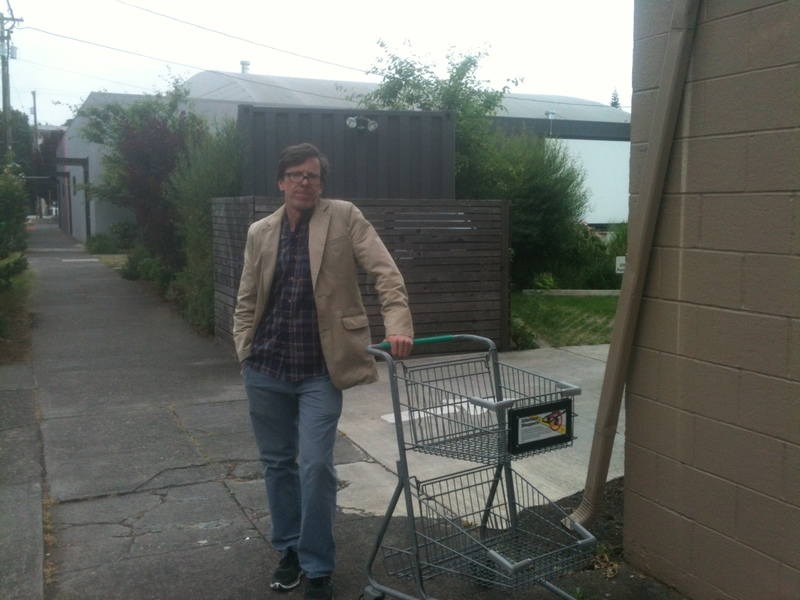 The author with a shopping cart; an uneasy truce. 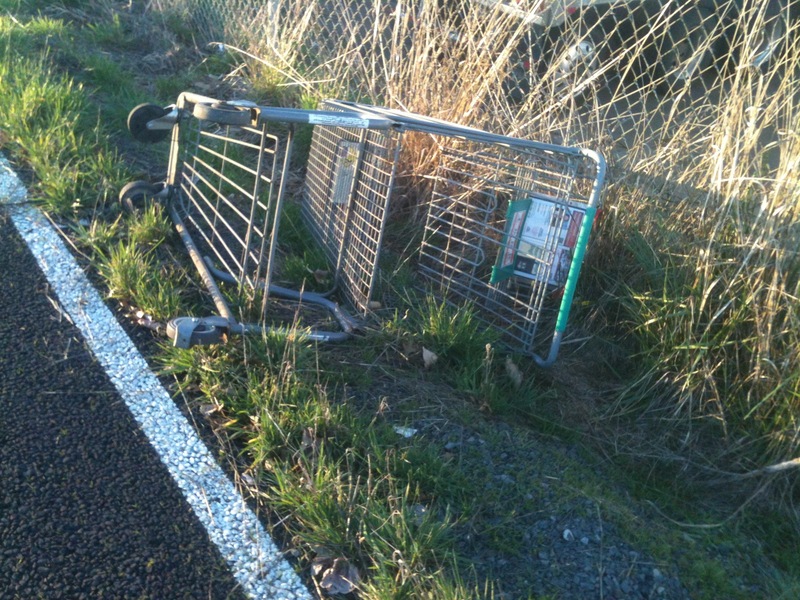 In Pittsburgh, shopping carts are called “buggies”, which could make a good parallel post “Buggiesburgh”…except we really don’t have a lot of lost buggies. Maybe you’ll start seeing them more. Some have been cleaned up but they do seem to be everywhere.